The following BPS-Standards will be the focus of instruction for this unit of study. SCI-MS.PS1.01 Develop models to describe the atomic composition of simple molecules and extended structures. SCI-MS.PS1.02 Analyze and interpret data on the properties of substances before and after the substances interact to determine if a chemical reaction has occurred. SCI-MS.PS1.03 Gather and make sense of information to describe that synthetic materials come from natural resources and impact society. SCI-MS.PS1.04 Develop a model that predicts and describes changes in particle motion, temperature, and state of a pure substance when thermal energy is added or removed. SCI-MS.PS1.05 Develop and use a model to describe how the total number of atoms does not change in a chemical reaction and thus mass is conserved. SCI-MS.PS1.06 Undertake a design project to construct, test, and modify a device that either releases or absorbs thermal energy by chemical processes. The benchmarks colored BLUE "Need to Know" indicate them as identified for targeted for all students to master, with YELLOW "Important to Know" supporting the priority benchmarks. This was a prioritization process not an elimination - the white are the overall supporting benchmarks. How can I tell the difference between a solid, liquid, gas, and plasma (the states of matter)? How do I describe the difference betwe en the states of matter according to their mass, volume, density, shape, and particle arrangement? Can I draw the differences between the states of matter according to their mass, volume, density, shape, and particle arrangement? States of matter are the different forms in which matter can exist. Look at Figure. It represents water in three states: solid (iceberg), liquid (ocean water), and gas (water vapor in the air). In all three states, water is still water. It has the same chemical makeup and the same chemical properties. That’s because the state of matter is a physical property. This photo represents solid, liquid, and gaseous water. Where is the gaseous water in the picture? These three states of matter are common on Earth. What are some substances that usually exist in each of these states? Describe matter in the solid state. 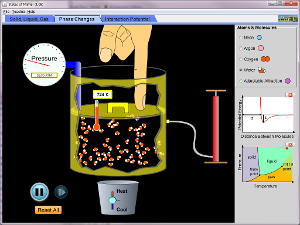 Explain the relationship between energy and states of matter. Ice is an example of solid matter. A solid is matter that has a fixed volume and a fixed shape. Figure below shows examples of matter that are usually solids under Earth conditions. In the figure, salt and cellulose are examples of crystalline solids. The particles of crystalline solids are arranged in a regular repeating pattern. The steaks and candle wax are examples of amorphous ("shapeless") solids. Their particles have no definite pattern. The volume and shape of a solid can be changed, but only with outside help. How could you change the volume and shape of each of the solids in the figure without changing the solid in any other way? Ocean water is an example of a liquid. A liquid is matter that has a fixed volume but not a fixed shape. Instead, a liquid takes the shape of its container. If the volume of a liquid is less than the volume of its container, the top surface will be exposed to the air, like the oil in the bottles in Figure . Each bottle contains the same volume of oil. How would you describe the shape of the oil in each bottle? Two interesting properties of liquids are surface tension and viscosity. Surface tension is a force that pulls particles at the exposed surface of a liquid toward other liquid particles. Surface tension explains why water forms droplets, like those in Figure. Viscosity is a liquid’s resistance to flowing. Thicker liquids are more viscous than thinner liquids. For example, the honey in Figure is more viscous than the vinegar. These images illustrate surface tension and viscosity of liquids. Water vapor is an example of a gas. A gas is matter that has neither a fixed volume nor a fixed shape. Instead, a gas takes both the volume and the shape of its container. It spreads out to take up all available space. You can see an example in Figure. When you add air to a bicycle tire, you add it only through one tiny opening. But the air immediately spreads out to fill the whole tire. You’re probably less familiar with plasmas than with solids, liquids, and gases. Yet, most of the universe consists of plasma. Plasma is a state of matter that resembles a gas but has certain properties that a gas does not have. Like a gas, plasma lacks a fixed volume and shape. Unlike a gas, plasma can conduct electricity and respond to magnetism. That’s because plasma contains charged particles called ions. This gives plasma other interesting properties. For example, it glows with light. Where can you find plasmas? Two examples are shown in Figure. The sun and other stars consist of plasma. Plasmas are also found naturally in lightning and the polar auroras (northern and southern lights). Artificial plasmas are found in fluorescent lights, plasma TV screens, and plasma balls like the one that opened this chapter. Both the northern lights (aurora borealis) and a plasma TV contain matter in the plasma state. What other plasmas are shown in the northern lights picture? Why do different states of matter have different properties? It’s because of differences in energy at the level of atoms and molecules, the tiny particles that make up matter. Energy is defined as the ability to cause changes in matter. You can change energy from one form to another when you lift your arm or take a step. In each case, energy is used to move matter — you. The energy of moving matter is called kinetic energy. The particles that make up matter are also constantly moving. They have kinetic energy. The theory that all matter consists of constantly moving particles is called the kinetic theory of matter. You can learn more about it at the URL below. Particles of matter of the same substance, such as the same element, are attracted to one another. The force of attraction tends to pull the particles closer together. The particles need a lot of kinetic energy to overcome the force of attraction and move apart. It’s like a tug of war between opposing forces. The kinetic energy of individual particles is on one side, and the force of attraction between different particles is on the other side. The outcome of the "war" depends on the state of matter. This is illustrated in Figure below and in the animation at this URL: http://www.tutorvista.com/content/physics/physics-i/heat/kinetic-molecular-theory.php. Kinetic energy is needed to overcome the force of attraction between particles of the same substance. In solids, particles don’t have enough kinetic energy to overcome the force of attraction between them. The particles are packed closely together and cannot move around. All they can do is vibrate. This explains why solids have a fixed volume and shape. In liquids, particles have enough kinetic energy to partly overcome the force of attraction between them. They can slide past one another but not pull completely apart. This explains why liquids can change shape but have a fixed volume. In gases, particles have a lot of kinetic energy. They can completely overcome the force of attraction between them and move apart. This explains why gases have neither a fixed volume nor a fixed shape. A solid is matter that has a fixed volume and a fixed shape. A liquid is matter that has a fixed volume but not a fixed shape. A gas is matter that has neither a fixed volume nor a fixed shape. Like a gas, plasma lacks a fixed volume and shape. Unlike a gas, it can conduct electricity and respond to magnetism. The state of matter depends on the kinetic energy of the particles of matter. The molecules of a gas in a closed container, such as a balloon, are not only constantly moving. They are also constantly bumping into each other and into the sides of their container. The sketch in Figure shows how this happens. The force of the particles against whatever they bump into creates pressure. The particles of a gas keep bumping into the sides of its container. Pressure is defined as the amount of force pushing against a given area. How much pressure a gas exerts depends on the amount of gas. The more gas particles there are, the greater the pressure. You usually cannot feel it, but air has pressure. The gases in Earth’s atmosphere exert pressure against everything they contact. The atmosphere rises high above Earth’s surface. It contains a huge number of individual gas particles. As a result, the pressure of the tower of air above a given spot on Earth’s surface is substantial. If you were standing at sea level, the amount of force would be equal to 10.14 Newtons per square centimeter (14.7 pounds per square inch). This is illustrated in Figure below. Earth’s atmosphere exerts pressure. This pressure is greatest at sea level. Can you explain why? For a given amount of gas, scientists have discovered that the pressure, volume, and temperature of a gas are related in certain ways. Because these relationships always hold in nature, they are called laws. The laws are named for the scientists that discovered them. Boyle’s law was discovered in the 1600s by an Irish chemist named Robert Boyle. According to Boyle’s law, if the temperature of a gas is held constant, increasing the volume of the gas decreases its pressure. Why is this the case? As the volume of a gas increases, its particles have more room to spread out. This means that there are fewer particles bumping into any given area. This decreases the pressure of the gas. The graph in Figure below shows this relationship between volume and pressure. Because pressure and volume change in opposite directions, their relationship is called an inverse relationship. You can see an animation of the relationship at this URL: http://www.grc.nasa.gov/WWW/K-12/airplane/aboyle.html. As the volume of a gas increases, its pressure decreases. A scuba diver, like the one in Figure below, releases air bubbles when she breathes under water. As she gets closer to the surface of the water, the air bubbles get bigger. Boyle’s law explains why. The pressure of the water decreases as the diver gets closer to the surface. Because the bubbles are under less pressure, they increase in volume even though the amount of gas in the bubbles remains the same. Gas bubbles get bigger when they are under less pressure. Charles’s law was discovered in the 1700s by a French physicist named Jacques Charles. According to Charles’s law, if the pressure of a gas is held constant, increasing the temperature of the gas increases its volume. What happens when a gas is heated? Its particles gain energy. With more energy, the particles have a greater speed. Therefore, they can move more and spread out farther. The volume of the gas increases as it expands and takes up more space. The graph in Figure below shows this relationship between the temperature and volume of a gas. You can see an animation of the relationship at this URL: http://www.grc.nasa.gov/WWW/K-12/airplane/aglussac.html. As the temperature of a gas increases, its volume also increases. Roger had a latex balloon full of air inside his air-conditioned house. When he took the balloon outside in the hot sun, it got bigger and bigger until it popped. Boyle’s law explains why. As the gas in the balloon warmed in the sun, its volume increased. It stretched and expanded the latex of the balloon until the balloon burst. Amonton’s law was discovered in the late 1600s by a French physicist named Guillaume Amonton. According to Amonton’s law, if the volume of a gas is held constant, increasing the temperature of the gas increases its pressure. Why is this the case? A heated gas has more energy. Its particles move more and have more collisions, so the pressure of the gas increases. The graph in Figure below shows this relationship. As the temperature of a gas increases, its pressure increases as well. A woman checked the air pressure in her tires before driving her car on a cold day (see Figure below). The tire pressure gauge registered 32 pounds of pressure per square inch. After driving the car several miles on the highway, the woman stopped and checked the tire pressure again. This time the gauge registered 34 pounds per square inch. Amonton’s law explains what happened. As the tires rolled over the road, they got warmer. The air inside the tires also warmed. As it did, its pressure increased. A tire pressure gauge measures the pressure of the air inside a car tire. Why is the pressure likely to increase as the car is driven? Particles of a gas are constantly moving and bumping into things. This gives gases pressure. The gas laws describe the relationship among pressure, volume, and temperature of a given amount of gas. Matter is always changing state. Look at the two pictures of Mount Rushmore in Figure below. The picture on the left was taken on a sunny summer morning. In this picture, the sky is perfectly clear. The picture on the right was taken just a few hours later. In this picture, there are clouds in the sky. The clouds consist of tiny droplets of liquid water. Where did the water come from? It was there all along in the form of invisible water vapor. Both of these pictures of Mount Rushmore were taken on the same day just a few hours apart. Where did the clouds come from in the picture on the right? What causes clouds to form? And in general, how does matter change from one state to another? As you may have guessed, changes in energy are involved. Explain the role of energy in changes of state. Outline the processes of freezing and melting. Changes of state are physical changes in matter. They are reversible changes that do not involve changes in matter’s chemical makeup or chemical properties. Common changes of state include melting, freezing, sublimation, deposition, condensation, and vaporization. These changes are shown in Figure below. Each is described in detail below. Which process changes a solid to a gas? Which process changes a gas to a solid? Think about how you would make ice cubes in a tray. First you would fill the tray with water from a tap. Then you would place the tray in the freezer compartment of a refrigerator. The freezer is very cold. What happens next? The warmer water in the tray loses heat to the colder air in the freezer. The water cools until its particles no longer have enough energy to slide past each other. Instead, they remain in fixed positions, locked in place by the forces of attraction between them. The liquid water has changed to solid ice. Another example of liquid water changing to solid ice is pictured in Figure below. Water dripping from a gutter turned to ice as it fell toward the ground, forming icicles. Why did the liquid water change to a solid? The process in which a liquid changes to a solid is called freezing. The temperature at which a liquid changes to a solid is its freezing point. The freezing point of water is 0°C (32°F). Other types of matter may have higher or lower freezing points. For example, the freezing point of iron is 1535°C. The freezing point of oxygen is -219°C. If you took ice cubes out of a freezer and left them in a warm room, the ice would absorb energy from the warmer air around it. The energy would allow the particles of frozen water to overcome some of the forces of attraction holding them together. They would be able to slip out of the fixed positions they held as ice. In this way, the solid ice would turn to liquid water. The process in which a solid changes to a liquid is called melting. The melting point is the temperature at which a solid changes to a liquid. For a given type of matter, the melting point is the same as the freezing point. What is the melting point of ice? What is the melting point of iron, pictured in Figure below? Molten (melted) iron is poured into a mold at a foundry. It takes extremely high temperatures to change iron from a solid to the liquid shown here. That’s because iron has a very high melting point. If you fill a pot with cool tap water and place the pot on a hot stovetop, the water heats up. Heat energy travels from the stovetop to the pot, and the water absorbs the energy from the pot. What happens to the water next? If water gets hot enough, it starts to boil. Bubbles of water vapor form in boiling water. This happens as particles of liquid water gain enough energy to completely overcome the force of attraction between them and change to the gaseous state. The bubbles rise through the water and escape from the pot as steam. The process in which a liquid boils and changes to a gas is called vaporization. The temperature at which a liquid boils is its boiling point. The boiling point of water is 100°C (212°F). Other types of matter may have higher or lower boiling points. For example, the boiling point of table salt is 1413°C. The boiling point of nitrogen is -196°C. A liquid can also change to a gas without boiling. This process is called evaporation. It occurs when particles at the exposed surface of a liquid absorb just enough energy to pull away from the liquid and escape into the air. This happens faster at warmer temperatures. Look at the puddle in Figure below. It formed in a pothole during a rain shower. The puddle will eventually evaporate. It will evaporate faster if the sun comes out and heats the water than if the sky remains cloudy. Evaporation of water occurs even at relatively low temperatures. The water trapped in this pothole will evaporate sooner or later. If you take a hot shower in a closed bathroom, the mirror is likely to "fog" up. The "fog" consists of tiny droplets of water that form on the cool surface of the mirror. Why does this happen? Some of the hot water from the shower evaporates, so the air in the bathroom contains a lot of water vapor. When the water vapor contacts cooler surfaces, such as the mirror, it cools and loses energy. The cooler water particles no longer have enough energy to overcome the forces of attraction between them. They come together and form droplets of liquid water. The process in which a gas changes to a liquid is called condensation. Other examples of condensation are shown in Figure below. A gas condenses when it is cooled below its boiling point. At what temperature does water vapor condense? Water vapor condenses to form liquid water in each of the examples pictured here. Solids that change to gases generally first pass through the liquid state. However, sometimes solids change directly to gases and skip the liquid state. The reverse can also occur. Sometimes gases change directly to solids. The process in which a solid changes directly to a gas is called sublimation. It occurs when the particles of a solid absorb enough energy to completely overcome the force of attraction between them. Dry ice (solid carbon dioxide, CO2) is an example of a solid that undergoes sublimation. Figure below shows chunks of dry ice in water changing directly to carbon dioxide gas. Sometimes snow undergoes sublimation as well. This is most likely to occur on sunny winter days when the air is very dry. What gas does snow become? Solid carbon dioxide changes directly to the gaseous state. The opposite of sublimation is deposition. This is the process in which a gas changes directly to a solid without going through the liquid state. It occurs when gas particles become very cold. For example, when water vapor in the air contacts a very cold windowpane, the water vapor may change to tiny ice crystals on the glass. The ice crystals are called frost. You can see an example in Figure below. Frost is solid water that forms when water vapor undergoes deposition. Changes of state are physical changes. They occur when matter absorbs or loses energy. Processes in which matter changes between liquid and solid states are freezing and melting. Processes in which matter changes between liquid and gaseous states are vaporization, evaporation, and condensation. Processes in which matter changes between solid and gaseous states are sublimation and deposition.